A visual and very baffling effect. A ribbon gets cut and magically restores, but wait until you see it performed! Two tea chests are put on a tray. The chests have holes running through the sides, and through the holes a white ribbon is threaded. The ribbon can be initialed at each end by a spectator. The boxes are now parted, and the ribbon can clearly be seen to run from one chest to the other. 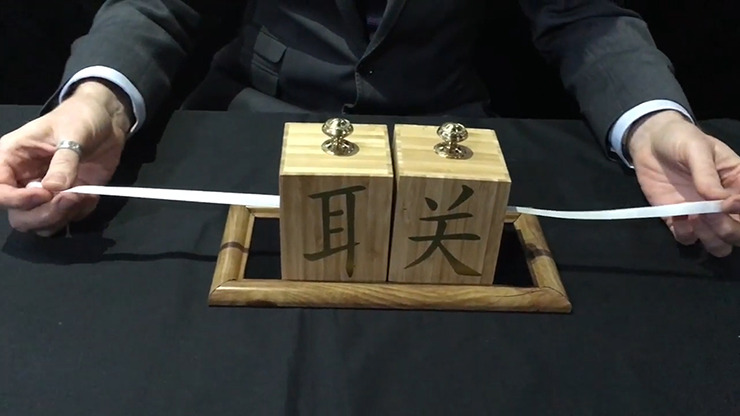 The ribbon is now CLEARLY cut between the two chests, and can now be seen to be in two halves. The boxes are placed next to each other, and the ribbon pulled from one end. Amazingly, the whole ribbon starts to move and can be pulled through the chests to show it is in one piece! The ribbon can now be examined to show that the initials are there, and it is indeed in one piece. It can be given away as a souvenir or used again. Get your hands on this ingenious effect before it's gone. Order today!